"Heartthrob" Luke (Ryan Gosling) is a stunt motorcyclist working as part of a travelling carnival. He rides into town, performs for the locals, then leaves. Given his nickname and outlaw allure, it's hardly surprising that he leaves behind a string of women as well, and upon returning to Schenectady, New York, he discovers that Romina (Eva Mendes), a woman he had a brief encounter with a year earlier, is the mother to his child. Determined to do right by his son because he's afraid that growing up without a father would turn him into a drifter like him, Luke sticks around when the carnival leaves town. Unfortunately, Luke is a man with good intentions but few options. After getting a job as a mechanic, his friend and boss Robin (Ben Mendelsohn) convinces him that the best use for his particular skill set is robbing banks. The two carry out a string of robberies and are able to squirrel away some cash for themselves and for Luke's son, but you can only keep going like that for so long before someone catches up to you. Or, as Robin puts it, "If you ride like lightning, you're going to crash like thunder." That 'crash' eventually brings them into contact with an ambitious beat cop named Avery Cross (Bradley Cooper), whose life - and the lives of a diaspora of other characters - is irrevocably changed by the association. If there is a single word that sums up The Place Beyond the Pines it would be "dissonant". Every aspect of the film seems to be, on some level, at war with itself, and it is visually, aurally and thematically jarring. The style of the film apes the intimacy of writer-director Derek Cianfrance's previous film, Blue Valentine, but the focus of the storytelling is completely reversed. It's not a small story about two people, but a grand saga spanning generations. The music throughout veers between atonal, disorientating guitars and soaring, sublime choral hymns, creating moments of dreadful unease and rhapsodic introspection. There are frequent moments throughout in which small, quiet actions are soundtracked by booming cacophony, and the quiet intensity of its focus on individuals seems to stand in opposition to its themes, which are about fathers, sons, and the unseen forces that shape our lives. Even its title denotes a duality: it's both the literal Mohawk translation of "Schenectady", which is practical and grounded in the real world, yet it's also very evocative of some 'other' place. There is a tremendous tension between these conflicting elements which is never satisfactorily resolved, but then again doing so would deprive it of much of what is interesting about it. It's a blue collar aria, and its strength lies in those contradictions. The disconnection between its constituent parts is what give it its infrequent yet undeniably potent power. Much as its opening shot follows Luke remorselessly as he leaves his trailer, walks through a carnival and sets up for his show, the film charts the actions of its characters doggedly and unremittingly. It presents a vast canvas, yet focuses intently on just a few threads. Where Blue Valentine was a story about a relationship spiralling inward, The Place Beyond the Pines is one about a relationship which spirals outward. A series of small things - a brief fling, a birth, a truth revealed - create ripples which grow and reverberate down the years. Derek Cianfrance is unashamedly making a film which aspires to being a saga, and his ambition is commendable. The greatest pleasure of the film is how much distance it manages to cover between its unassuming start and its frankly operatic final movement, illustrating sins of fathers which play out in dreadfully inexorable fashion. Cianfrance packs in so much incident that it feels like he has condensed an entire trilogy into a single film, which is undoubtedly impressive, but I found it hard not to feel like I'd eaten a slightly too-large meal by the time the credits rolled. Despite how stuffed the film feels, it rarely drags thanks to its relentless momentum and a superb cast. 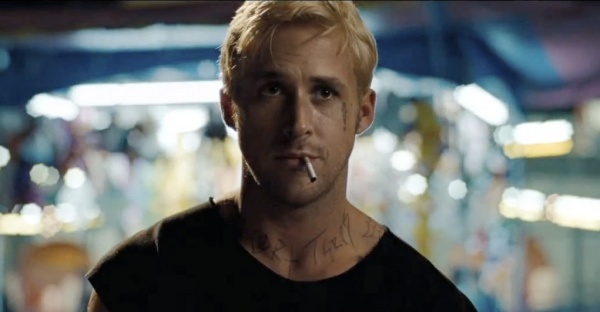 Gosling, covered in more tattoos than a dozen Russian gang members, is at his charismatic best as Luke, even rivaling Tony Leung as the actor who looks coolest while smoking. He manages to convince as both someone trying very hard to do the right thing while also being unequivocally a man of violence. Cooper's brand of aggressive intensity is well suited to the film, too; he's someone doing things which are objectively good while being an objectionable person. Much like the rest of the film, his presence adds contrast to the laid back intensity of Gosling. The low/high-life tapestry of the film is nicely rounded out by the likes of Dane DeHaan, Emory Cohen (playing one of the most eminently slappable characters this side of Joffrey Baratheon), Rose Byrne and an especially intimidating Ray Liotta, whose performances makes for an interesting counterpoint to his weak, pathetic turn in Killing Them Softly. For all that it has in its favour, The Place Beyond the Pines feels like a great film with a lot of caveats that stop it being truly stellar. Though the schism between its lofty aspirations and its earthy reality is interesting, it also highlights the things which Cianfrance is great at and the things he muddles through. He's great at capturing mood and emotion, and the best moments are the ones where he is able to focus on capturing the feelings of his characters. Whether it's the sense of freedom that Luke gets when he's riding, the fear and suspense of the robbery scenes or the heady, Oxy-generated euphoria of a party, Cianfrance's keen, close focus brings them to startling life. The grander, almost mythic narrative feels fuzzy in comparison. Whenever Cianfrance pulls back to look at the bigger picture, it actually ends up looking less clear than when he's focusing on the different parts. It doesn't help that the tone is almost unremittingly sombre, and the sense of self-importance doesn't resonate well with the intimacy that the film otherwise excels at. Ultimately, it seems that Cianfrance can't see the wood for the trees, but that shouldn't take away from how interesting those trees actually are.